In medium bowl, beat 2 tablespoons butter and the granulated sugar with electric mixer on low speed until light and fluffy. Add remaining cookie ingredients. Beat on medium speed 4 minutes, scraping bowl occasionally, until smooth. Onto cookie sheets, drop 28 slightly rounded tablespoonfuls of dough at least 2 inches apart. Bake 8 to 10 minutes or until tops spring back when lightly touched. Cool 2 minutes. Remove from cookie sheets to cooling racks; cool completely. In medium bowl, beat cream cheese, 1/4 cup butter and 1/2 teaspoon vanilla with electric mixer on low speed until well combined. Slowly add powdered sugar, beating on low speed until incorporated. Increase speed to medium; beat 1 minute. For each whoopie pie, spread 1 generous tablespoon filling on bottom of 1 cookie; place second cookie, bottom side down, on filling. Store in refrigerator. Sprinkle with additional powdered sugar, if desired. If you’re a coconut lover, try adding 2 tablespoons toasted coconut to the filling. 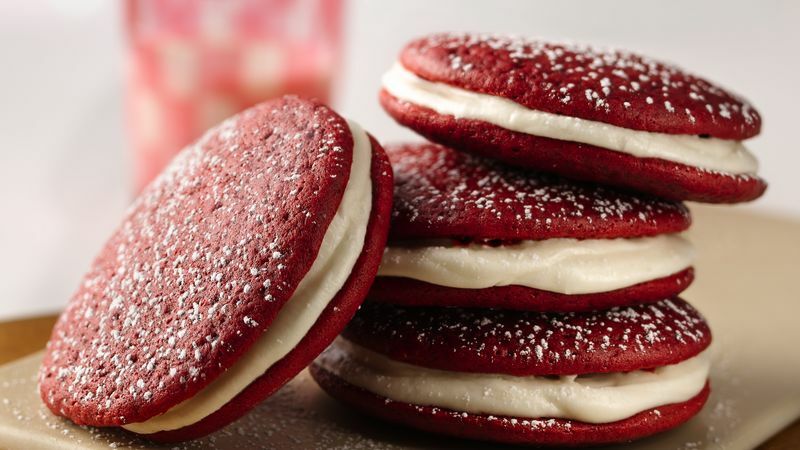 These Red Velvet Whoopie Pies would be a perfect sweet treat for Valentine’s Day.